OurLadysWarriors.org will make every attempt to have a signed copy delivered to you by 23 December 2005. The cost $17.95 for one book delivered in 5-7 days. For larger orders or for rush orders please contact Lori Myers. In Two Towers John Meehan gives a detailed plan for this enactment! But first he uncovers the deep-seated historical and cultural roots of the crisis in the Catholic Church in America - showing how the Two Towers of Faith and Morals have been separated. Mr. Meehan makes the case that the crisis will be resolved with the true implementation of Vatican Council II - especially with respect to the laity, catechesis, and liturgy. Mr. Meehan*s message is one that gives both understanding and hope. He draws upon his personal experiences, the writings of Church Fathers, contemporaries, and the popes - especially the writings of John Paul II, and the future Pope Benedict XVI (during his tenure as Prefect of the Congregation for the Doctrine of the Faith). John Daniel Meehan is the retired President and co-founder of Magdalen College in Warner, NH and the retired director of the Pope Paul VI Catechetical Institute. A Catholic Educator for nearly thirty years, he is the author of several books. 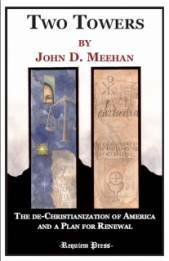 John Daniel Meehan is the retired President and co-founder of Magdalen College in Warner, NH and the retired director of the Pope Paul VI Catechetical Institute. A Catholic Educatior for nearly thirty years, he is the author of several books.